fly tying, conservation, fishing flies and photographs. Navigation menus may be blocked by your security software pop up blocker. Menus are warranted safe by Ally and can be allowed but you may also navigate via the site map. Fly fishing lessons, Spey casting, fly casting and fly fishing trips. Spey Casting and salmon and trout fly fishing Pitlochry, Scotland. Fly fishing lessons and fly casting tuition and instruction for salmon, sea trout, steelhead, grayling, pike and trout, fly tying, conservation, catch and release and fishing in Scotland together with articles about many aspects of fly fishing. Ally Gowans professional writer, photographer, fishing instructor and guide who provides top class tuition and instruction including Spey casting, underhand, roll and overhead casting with two handed rods and all types of single handed casts, including overhead and side casts, roll and Spey casts, underhand casts and the use of single and double hauls with those casts. Learn all the secrets for successful fly fishing. Ally's qualifications include APGAI trout, salmon and fly tying, AAPGAI Master and FFF Master Instructor and Two Handed Casting Instructor. Conservation pages contain the unique Gowans fish weight calculator, catch & release rules and other angling orientated biological information. Destinations include advice for the traveling angler and features on Scotland, Norway, Alberta, New Brunswick, British Colombia, Ireland and Spain. A fully guided fishing vacation and fly casting instruction service is available in Scotland. Spey casting and single handed casting schools are held in Scotland and various other countries including USA, Canada, England, Ireland and Italy. If you would like to arrange a fly fishing school close to your location contact Ally for details. Tackling Trout is a popular trout fly fishing course organised to suit private groups of 3 to 8 persons. This is an exciting opportunity to learn lots about trout, fly fishing, fly casting and entomology. Spey Casting Made Easy is a proven top class means of learning to Spey Cast and fly fish for salmon, organised to suit private groups of 3 to 6 persons. "Spey Casting Made Easy DVD" Learn the essentials for efficient Spey Casting. Buy now! River Tay and River Tummel Spey casting school "Spey Casting Made Easy" a great way to learn to fly fish for salmon. 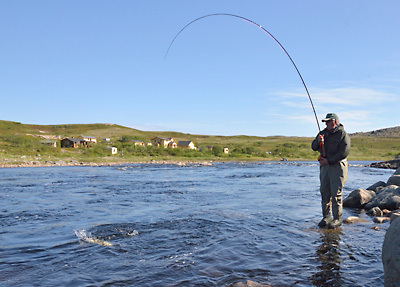 Spey casting and salmon fishing courses arranged to suit groups of three to six persons. Spey casting school content and other information. Photo sequences demonstrating Spey casting. Bulkley River steelhead fishing - new article about swinging flies for steelhead. What is the size of a salmon fly? Its confusing! Salmon fly size explained. Want to know how to shoot lots of line with a Spey cast? Flies pages include many patterns invented by Ally such as Ally's Shrimp (voted "Salmon Fly of the Millennium" by readers of EMAP publications), Cascade, Yellow Ally's and other salmon flies that have proven themselves over the years. Various types of salmon flies including some very old examples and many excellent trout fly patterns are pictured. Photography gives a glimpse of some of the extensive library of fishing pictures available covering most aspects of salmon and trout fly fishing, casting, rivers and lakes in various countries. Links pages lead you to other great fly fishing sites including www.flyfish-scotland.com which contains lots more advice for fly fishing in Scotland. Alastair (Ally) Gowans BSc CEng APGAI, AAPGAI & FFF Master and Two Handed Fly Casting Instructor, Gamefishing consultant, writer, photographer and instructor. Web site designed, illustrated and produced by Alastair Gowans.